B.B.E Vaiala continues their winning streak at Apia Park. Yesterday, at the Apia Rugby Unions Talua 7’s, the cup final boiled down to a nail biting match between Moataa and B.B.E with a final score of 12-14. Moataa and B.B.E. Vaiala were an equal opponent and it was a quite explosive match from the very start. Moataa and Vaiala were both a very physical team, muscling their way out of tackles and bulldozing anyone standing in their way. The high intensity tempo of the game in the beginning of the match made it electrifying match to watch. However, late in the first half it was clear fatigue was knocking both teams and intensity soon turned into bad decision and a few injuries. Back from half, Moataa and B.B.E Vaiala were still neck and neck despreeat to get ahead of each other. It was then Moataa broke into stride and B.B.E Vaiala found themselves defending their own 22. However, there quite a few crucial ball handling errors in the red zone from Moataa. Time was dwindling and B.B.E stepped up their defence. Moataa desperately and unsuccessfully had several attempts to muscle in the ball over the try line but Vaiala overpowered them and refused to let the ball touch a single blade of grass in the try zone. Taula’s Commercial Manager Mahendra (Mike) Mahimkar and Production Manager Luatua Leiite Setefano were both present during the tournament and were also amazed at the nail biting final. 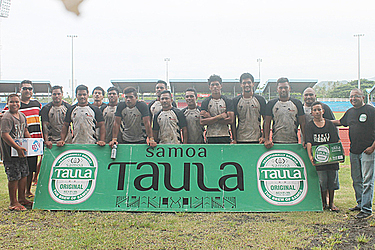 Taula has been a instrumental sponsor of the Apia Rugby Union to allow for tournaments like this to continue to develop and cultivate the skills of our local sevens players.